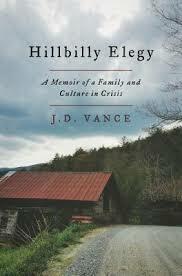 Hillbilly Elegy by J.D. Vance was a really compelling memoir by someone born into difficult circumstances who with key help provided along the way, made it to his current state of being a 31-year-old Yale Law graduate working as a principal at a Silicon Valley investment firm. Vance grew up in the Rust Belt city of Middletown, Ohio, with his grandparents from the Appalachian town of Jackson, Kentucky, and he notes that places like Middletown have over the years become practically feeder towns for those leaving Appalachia. Many of the problems of unstable home lives, alcoholism, and at least flirting with poverty have fed into the new communities and Vance writes how the problems of Middletown in many ways mirror those in the inner cities of metropolitan areas. There's such a sense of upheaval and uncertainty for kids growing up in that region and Vance writes of how he doesn't view himself as a genius preordained to make it out, but rather someone shepherded during the times he most needed stability. When his mom would either be on a bender or otherwise busy switching from one failed male relationship to another, Vance was able to go his grandmother or even rely on his older sister. There was certainly entertaining reading in the book about hillbilly justice administered by his extended family, but the biggest thing that gave Vance a chance was this stability that wasn't coming from a more traditional mother and father present for him home life. Vance lived full-time with his grandmother the last few years of high school and then spent four years in the Army prior to attending Ohio State University and Yale Law School. The book is a very fast read and interesting in that it tells the story of Vance’s upbringing, but also the themes related to his success. There's both the need for kids to have stability growing up and notion that even in areas where jobs are scarce, the larger problem can be a scarcity of a culture of hard work and idea that, especially with some help along the way, someone can overcome obstacles and have control over their life, effectively breaking out of a cycle. 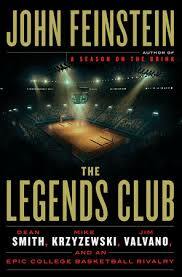 The Legends Club by John Feinstein has the subtitle Dean Smith, Mike Krzyzewski, Jim Valvano, and an Epic College Basketball Rivalry and covers well the three men, and particularly the relationships between them. Feinstein notes in the beginning how Smith was hired by North Carolina in 1961 and in a nine-day period in 1980, Duke and NC State hired Valvano and Krzyzewski. The three men were very different from one another, with Smith the cover all bases in the pursuit of winning obsessive, Valvano the comet across the sky force of personality, and Krzyzewski the grinder, who adapted himself to succeed and improved in areas he needed to. A commonality between the men seems to in their character, with one example Smith decades ago telling Feinstein that "you should never be proud of doing the right thing. You should just do the right thing" and another Valvano's speech at the 1993 ESPY Awards just prior to his death from cancer. The interactions written of between Krzyzewski and Valvano prior to him dying and then later between Krzyzewski and Smith prior to the former North Carolina coach dying were the most compelling parts of the book, first with Valvano undergoing cancer treatments at Duke and Krzyzewski often at his bedside and then Krzyzewski spending time with Coach Smith as he suffered from Dementia prior to his death in 2015. There was definitely some poignant scenes written of the book and Feinstein seemed to do a very good job writing about the men, their competition with one another, and their coming together. 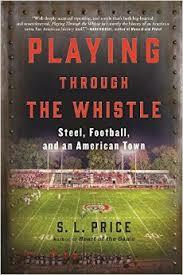 Playing Through the Whistle: Steel, Football and an American Town by S.L. Price was a really good book from the Sports Illustrated writer who has penned three other books I've enjoyed, Pitching Around Fidel: A Journey Into the Heart of Cuban Sports and especially Far Afield: A Sports Writer's Odyssey and Heart of the Game: Life, Death and Mercy in Minor League America. Playing Through the Whistle expands greatly on a feature for SI several year ago and the book is a look at the dying town of Aliquippa, PA and high level football from a high school that's produced NFL stars Mike Ditka, Ty Law, Sean Gilbert, and Darrelle Revis. Additionally from Aliquippa were Henry Mancini, composer of Moon River, the father of basketball star Pete Maravich, and former Surgeon General Jesse Steinfeld. Price wrote of how early Aliquippa was the story of immigrants, people who came with nothing but the desire to work hard and who formed a life, for many of them through their labors on behalf of the Jones & Laughlin Steel Corporation (or J&L Aliquippa Works) in town. Towards the beginning of the book, the struggle between the employer and unions coming in is chronicled and then later on, racial tension in town (and America as a whole) detailed. In 1962, some black players walking off the football team to protest the lack of any black cheerleaders on the squad, and then Price provides remarkable reading about the fights in town between blacks and whites in the 1970's. In many ways, the book is a history of class and race in America, told through the prism of the town, football in it, and a struggle between sports as a positive force and societal and economic problems off the field. Another major local sports star that Price wrote about was former Cowboys star Tony Dorsett, who played for nearby Hopewell Senior High in the early 1970's as Aliquippa High was in the quagmire of racial tension and constant fights. Dorsett not going to Aliquippa High School echoed what many families who could were doing, moving their kids out of Aliquippa public schools, either by sending them to private schools or just moving away to areas like that covered by Hopewell High. From an economic perspective, Aliquippa Works in 1979 employed 10,000 people, then in 1981 the bleed of jobs began and by 1985 there were only 700 remaining. As jobs were leaving town, crack cocaine came to Aliquippa in the mid 1980's and the drug trade, and accompanying violence, hit the town hard. Aliquippa High School was often a dangerous place and for many there, it was a choice between football or the streets, with each pulling on them. The book closes out with modern day Aliquippa and paints a picture of a hard town and a hard life for those who live there, with things seemingly going the wrong direction. Some people succeed and get out, but it's a tough go for the place when the primary goal for those looking to achieve something positive includes them leaving. 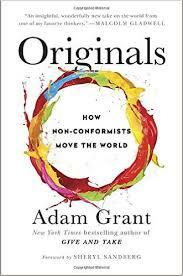 Originals: How Non-Conformists Move the World by Adam Grant was an interesting read that brought to mind books such as those by Stephen Dubner and Steven Levitt and by Malcolm Gladwell. Grant is an acclaimed 35 year-old professor at the Wharton School of Business and in Originals, he puts forth a number of compelling ideas, some he covered in his February 2016 TED Talk, "The surprising habits of original thinkers." Those included the benefits of procrastination, with the example of how Martin Luther King Jr. delayed in writing his "I Have a Dream" speech and his ideas germinated, and the power of those who have doubts about their ideas and proceed cautiously, with the example of Grant's students who started the business Warby Parker. Some of the ideas from Originals that weren't in Grant's TED Talk included how people who use Firefox or Chrome as their PC browser in aggregate tend to be more successful than those who use an already installed web browser because they took the initiative to go and get something different, and how if you want to do original and impactful work, the big thing is to do a lot of work, much of it unremarkable. Also tremendously interesting from Originals was the chapter on leaders in the women's rights movement who in the 1800's should have been allies, but became bitter enemies, delaying success for the movement. The idea that Grant put forth was that if people agree on some things, their disagreement on others can be much more profound than disagreements between people who don't agree on anything, and never expected to. Very much related to this idea is how methods and tactics can be more important than values, as they're more easily agreed upon, and can avoid the bitter fights over value differences. From Grant in his chapter on first and later born kids was the concept of praising and speaking to character rather than actions, with the example "don't be a cheater," rather than "don't cheat," having more impact. It's an interesting idea which actually runs counter to notions I've seen elsewhere about praising the actions and activities of kids rather than making character based statements out of their actions. The final concept out of Originals to note here was the the idea of fighting a battle in different ways depending on how strong the support for your fight. Grant told the story of the non-violent resistance group Otpor! that helped lead the charge to overthrow Slobodan Milošević in Yugoslavia. When Otpor! was gathering support for the cause, they focused having people feel part of a larger group opposing Milošević and engaging in smaller-scale resistance tactics they could get behind and not feel exposed them to much retribution and danger. Along these lines, a story was told how in Chile in the 1980's, people drove slowly in town to protest the Pinochet government and in Poland, people pushed their televisions in wheelbarrows through town to protest government lies in the news. The idea of all this was that when commitment toward a goal is wavering or thin, it's best to consider progress already made, or focus on humor, then when commitment solid, it's then best to look at bad things to overcome or avoid or work still to be done. If that "negative motivation" brought up too soon, it can jeopardize the movement before it gains it's footing. Labels: Adam Grant, book review, Originals, Otpor! 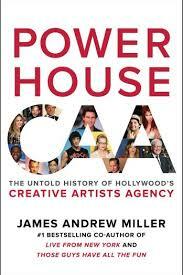 Powerhouse by James Andrew Miller was an interesting oral history on Creative Artists Agency, the firm that, along with other businesses it's in such as corporate consulting and marketing services, represents many Hollywood and professional sports stars. The agency was started in 1975 by five agents who left William Morris and Miller particularly covers Michael Ovitz, one of the five and the man who became CAA president. There was great detail in the book about how Ovitz to further his career both prepared and hustled, with anecdotes about him as a junior staffer at William Morris noticing that the company president always came back in after dinner, so Ovitz would make sure he was also there, ready and willing to help with anything needed, and out of this became the assistant to the president at twenty-two years old. In terms of Ovitz's preparation and ferreting out of information, Miller devotes quite a bit of space in the book to how CAA got into corporate advising when they figured out a Japanese corporation interested in buying a studio and set up the deal, collecting $46M in fees in the process. Also interesting in Powerhouse was material around how Ovitz and Ron Meyer, one of the other co-founders, had styles and strengths that very much complimented one another and then around how Ovitz seemed to become corrupted by the power he held and just how messy his leaving CAA was. He had negotiated a deal to leave CAA and take over Universal, but made things so difficult the deal eventually fell apart and Ron Meyer was offered and took the job. Ovitz then left to work under Michael Eisner at Disney, with that relationship fairly immediately running into trouble and Ovitz out within about a year. The book's later part covers what CAA has become since Ovitz, with it a powerful corporation in huge competition with the agencies UTA and the much larger WWE/IMG. I found Miller's book on ESPN, These Guys Have All the Fun, to be more interesting due to the subject matter, but Powerhouse was a solid read for anyone interested in the machinations of power and the entertainment world. 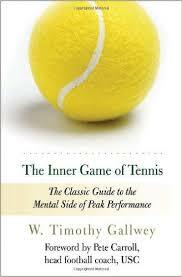 The Inner Game of Tennis by Timothy Gallwey was an interesting read that I heard of from an article by Chris Ballard for Sports Illustrated titled "The little-known book that shaped the minds of Steve Kerr and Pete Carroll." Gallwey's book is subtitled The Classic Guide to the Mental Side of Peak Performance and in it, he writes of how "every game is composed of two parts, an outer game and inner game, that which takes place in the mind of the player, and is played against such obstacles as lapses in concentration, nervousness, self-doubt, and self-condemnation." This inner game is written of by Gallwey as being one that can easily hurt us, with our "telling self" judging results, and distracting from our "doing self" completing activities. In terms of simply doing, Gallwey writes of how if we focus on having a clear picture of what we want to accomplish and then just act, we'll likely be happier when all said and done. This clear picture can be formed by observation, of both others and ourselves, with a non-judgmental awareness of our movements. It's a short book from Gallwey and one with some compelling ideas. 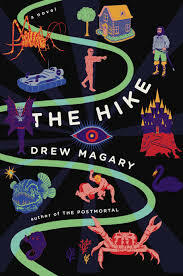 The Hike by Drew Magary was the third book, and second novel, I've read from the author who also has written extensively for GQ and Deadspin. The Postmortal from Magary imagines a society made completely different than it is today and The Hike starts with an average guy getting lost in the woods, and then departing from the world we know into a dystopian alternate universe. I found my interest in the book waning a bit at times, but it did wind up with a really interesting and unexpected ending and including magazine and website pieces from Magary I've read and posted on, I find him to be an entertaining writer. 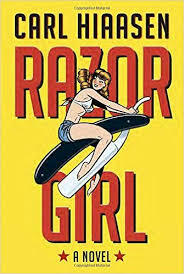 Razor Girl by Carl Hiaasen is the latest installment of fiction by the Florida-based writer on characters in his wacky state and just like the prior books below I've read from Hiaasen, quite the entertaining read. Additionally interesting to me about Hiaasen is that his writing can also be found in the Miami Herald in the form of a recurring column. 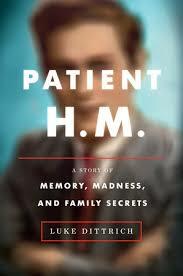 Patient H.M. by Luke Dittrich is a book that dealt not only with an interesting topic, but one in which the author personally invested. Dittrich's grandfather was Dr. William Scoville, one of the foremost medical proponents of lobotomies as a treatment method and Patient H.M. tells the story of Henry Molaison, perhaps the most famous patient in medical history, someone with his memory inexorably altered as the result of an operation conducted by the prolific Dr. Scoville. Many of the lobotomies Scoville conducted during his career were done at asylums, on patients likely in no condition to agree to the procedure, but the 1953 surgery on Molaison an elective one to relieve the severe epilepsy and seizures he suffered from. The outcome was Molaison rendered unable to form any new long-term memories, and because he not mentally ill, also able to give interviews for decades about his experiences and memories, providing medical science much of what's known about memory today. I liked the ending of the book jacket description of it as a one "that reveals the wondrous and devastating things that can happen when hubris, ambition, and human imperfection collide" and Dittrich tells an interesting story of medicine, surgical practices bordering on barbarism, and family secrets, with him learning that his grandfather likely performed brain surgery on Dittrich's grandmother who was in and out of institutions. Labels: book review, Luke Dittrich, Patient H.M.
Astoria by Peter Stark tells the story of millionaire John Jacob Astor's attempt to establish a global trade network with a foothold in the Northwest. The effort, blessed by then President Thomas Jefferson and starting shortly after Lewis and Clark's voyage concluded in 1806, included sea otter pelts from the region and trade with both the East Coast of the U.S. and for goods across the Pacific. The attempt to create a settlement in modern-day Oregon included an overland party led by Wilson Price Hunt and one via the ship Tonquin and Captain Jonathan Horn sailing from New York around the bottom of South America in the Tonquin. The story of Horn felt the more fascinating of the two, with him being the first to arrive, reaching the Columbia River Bar on March 22, 1811. He faced incredibly dangerous water conditions exiting the Pacific Ocean and eight of the roughly sixty men aboard the Tonquin perished in the water. Thorn later journeyed with a group of around thirty to trade with Pacific Northwest Coast Indians off what is now Vancouver Island, with disastrous results. Hunt's party travelling overland also experienced an extremely hard path and interesting from Stark was mention of people from both parties suffering from what centuries later would be known as post traumatic stress disorder, brought of by the constant exposure to potential calamity. The two leaders were interesting case studies, with Hunt a consensus seeker, good in some respects, not good in others, and Thorn well equipped for battle as a sea Captain, but without the diplomacy required to interact well with Indian populations. 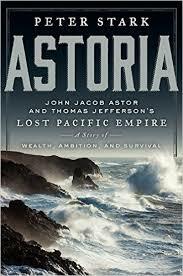 War between America and Britain with the War of 1812 brought about the end of Astoria, with Astor's plan to fortify and defend the settlement ultimately unsuccessful as a ship he dispatched became disabled off Hawaii and Hunt was away from Astoria at a time leadership desperately needed. While Hunt was gone, those who remained decided to abandon Astoria and sold the remaining furs and goods to the British North West Company for around $.30 on the dollar. The success or failure of the venture is up for debate, with roughly sixty of the hundred and forty men Astor sent losing their lives, but the trip also helped pave the way for a later move westward, with the overland path an important precursor to exploration in large part due in part to them finding the what would become known as the Oregon Trail. Really a compelling story well told in the book. 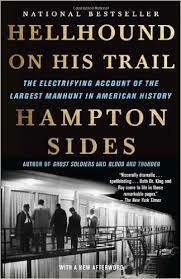 Hellhound On His Trail by Hampton Sides was a great book about the manhunt for James Earl Ray, the killer of Martin Luther King Jr. The book starts with the escape of a prisoner in April, 1967, one year before the assassination of King, and there's fascinating detail in it about Ray, his actions and the times. Sides covers well King and his Poor People's Campaign to occur Washington D.C., the enmity towards King by J. Edgar Hoover, longtime director of the FBI, and former Alabama governor George Wallace running for President on an isolationist and segregationist platform. Much of the book is a coming together of people and events and King was shot maybe 40% of the way through it. After this, Sides covers Ray fleeing Memphis, and the incredibly thorough and old fashioned pounding the pavement detective work that went into identifying and searching King's killer. Details about the 65 day manhunt included Ray going to Atlanta, his car being discovered there, then clothes of his being traced to a Los Angeles area dry cleaner, which led to the FBI discovering a fingerprint match that established his identity. After this, police found that he had spent time in Canada under an assumed name. Then Canadian authorities poured over passport applications, found that Ray went Europe and alerted authorities there. Even with that alert going out, Ray was only apprehended trying to leave London as the result of authorities noticing he had a second passport, cancelled due to misspelling in the name, and someone then connecting that he was a fugitive. Incredibly, after Ray was returned to America and sent to state prison for the murder of King, he escaped and was caught in the mountains after 54 hours on the run. It's a remarkable story told with great detail by Sides and I enjoyed it at least as much as I did two other excellent reads from Sides, Ghost Soldiers, and In the Kingdom of Ice. Labels: book review, Hampton Sides, Hellhound On His Trail, Martin Luther King Jr. 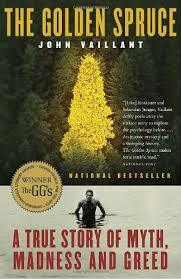 The Golden Spruce by John Vaillant was an interesting book from 2005 about the illegal felling of a giant tree off the Northwest coast of Canada. I previously enjoyed quite a bit Vaillant's later book, The Tiger, and in The Golden Spruce, he does the same excellent job of blending together stories about a fascinating region and things that occurred within it. It was a fast read and a much longer than this one review of the book was done for the Seattle PI by John Marshall. 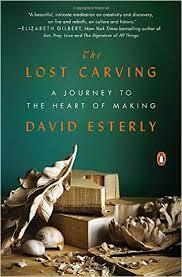 The Lost Carving by David Esterly was a solid book about a year Esterly spent restoring wood carvings damaged in a 1986 fire at Hampton Court Palace in England. The limewood carvings were done in the late 1600s by Grinling Gibbons and depicted Gibbons' primary subject area of flowers, fruits and foliage. Esterly at the time of the fire was one of the few professional carvers working in limewood and as a young man was an academic at Cambridge, then left for America and took various teamsters jobs. He became interested in carving after seeing a Gibbons exhibition and the book describes the craft as a sort of duality between mind and body. I found interesting the description from Esterly of carving involving the two hands working against each other to accomplish a goal and in many ways, The Lost Carving is a meditative book about creation and creativity that comes through the form on working with your hands. Two things I loved at the end of the book were a quote from Benjamin Franklin that "well done is better than well said" and Esterly writing that it's better at bedtime to be physically tired than mentally exhausted. Also about the craft of carving, Esterly wrote on spending time carving areas in the back of a piece of work, places that people won't see. The term Esterly uses for this type of endeavor is conscientiousness and there's quite a bit in the book about his quest to do right by the work. Along with the effort put into the carvings, Esterly covered the political decisions he had to navigate through, with an example being whether to have the carvings remain light as Gibbons did them or have a varnish to make the carvings look more like they did at the time of the fire. It's really a cool book for anyone interested in creativity and making things. 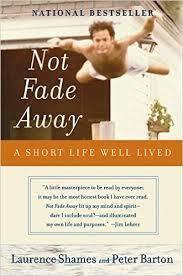 Not Fade Away by Laurence Shames and Peter Barton was an excellent book from Barton, former CEO of Liberty Media, co-written with writer and journalist Shames about Barton's life and his death from stomach cancer in 2002 at the age of 51. The subtitle to the book is "a short life well lived" and Shames in it noted how Barton in response to a question of why spend time on it while dying said that he wanted his kids to know more about who he was and what he valued and I found compelling Barton's thoughts on both his life and career. When writing about his childhood, Barton noted that he became a good student when he realized that school is basically a game, and as with any game, it's more fun if you win. Barton also very much did what he felt he should, even if it seemed less than traditional, and left his masters program in International Relations at Columbia just shy of graduating as he realized it was leading him to work he didn't want to do. After then working in the Public Sector, including a stint with the Governor of New York, Barton went to Business School and coming out of that, wanted his next job to be one that was (A) in an up and coming industry, (B) working directly for the head of a company, and (C) working for someone he thought wildly smart. Barton sent letters to 231 CEOs in Boston, San Francisco and Denver offering to work for free for 90 days, had 123 respond, and wound up with the cable company TCI, led by John Malone. The company became Liberty Media under Malone and Barton and in the book, Barton wrote of work as being something that should not being in the spirit of trading time for money, but with the joyful ambition of creating something. Barton also noted that while his approach to business could seem reckless at times, he was prepared, knew where he wanted to wind up, and worked towards that. After Barton retired from Liberty at 45, and a year before he got diagnosed with cancer in 1998, he would take his kids and their friends on what he called Real World Outings to see how people made their livings. Each excursion had a theme, including one on luggage, where they went and saw people who made it, sold it, and those who handled it at the airport. Barton wrote in the book how he realized while in a particularly difficult time with his cancer that finding a point to continue fighting became the point and just prior to the epilogue, wrote of his life, "I really tried. I did my best." An excellent book, highly recommended. 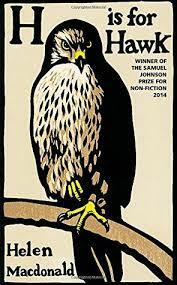 H is for Hawk by Helen Macdonald was about the author training a goshawk after the recent death of her father and a creative and almost lyrically written book. It's close to equal parts a meditation on grief and appreciation of the natural and wild world as the process of training her hawk, Mabel, closely intertwines with the loss she experienced. Macdonald became somewhat of a recluse during the training period and when about halfway through the book she wrote of Mabel that "she's forgotten how not to be scared of people," the author could have been writing of herself as well. While I don't know I would call it a particularly enjoyable read, it was an impressive effort and felt to sum up well in the acknowledgments with Macdonald writing "I would like to thank my father who taught me how to love the moving world, and to thank my beautiful hawk who taught me how to fly in it after he was gone." 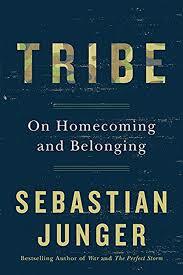 Tribe: On Homecoming and Belonging by Sebastian Junger was a solid book about the important topic of how divided as a society we can be. Junger writes of how these divisions typically fall away during times of great stress such as war or natural disaster as people are in it together, as a "community of sufferers." He additionally notes how the mental health of individuals also can improve during these times, with the bombing of London during WWII and more recently in Sarajevo cited as cases where people living in war zones generally weren't depressed, just resolute and living their lives. There was a collective cause, even if that cause was simply surviving. Also covered in the book is how there's such a disconnect between modern society and combat veterans returning to it. For people who haven't served in wartime, the large majority of those here in the US, it's difficult to understand what vets went through, and veterans often don't have outlets where they can speak about their experiences, both educating others and unburdening themselves. It's a short book, with Junger describing it an a Time Magazine interview as a screed, and interesting reading about this concept of Tribe and how many in modern society simply don't feel part of one. The Oregon Trail by Rinker Buck was an entertaining and in many cases heart-warming road trip book about Buck and his brother Nick traveling the Oregon Trail, from St. Joseph, Missouri to Baker City Oregon, via covered wagon. A trip such as this almost certainly hadn't been done in the past hundred years and Buck at the end of chapter one wrote of how "it was crazyass passion that would deliver me to the trail" and the 50 to 60-some year-olds were led by three mules, Beck, Jake, and Bute, roughly 2,000 miles over four months. 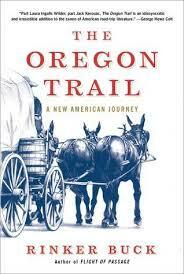 The book was part travelogue, history lesson, and remembrance on family, with Buck writing about his late father. During the trip, Buck and his brother had a sign on the back of the wagon apologizing to other travelers for the delay because they wanted to "see America slowly," an almost identical sign to what his family had during an East Coast covered wagon trip in 1958. The stories of the travel to Oregon were compelling reading, with the two, along with Nick's dog Olive Oyl, meeting strangers, fixing problems, and sleeping outside, Rinker on a mattress in the back of the wagon and Nick in whatever barn or enclosed space he could find. Related to this, Buck notes towards the end of the book how many times in the west they would overnight in public spaces, with the mules in public corrals, areas like national parks designed to provide for the citizens. The anecdotes of the people they met were great, with so many enchanted by the idea of the trip and helping immeasurably, and the brothers definitely had some hairy moments on the trail, but soldiered through them. Tying back to their father, I liked the mention of him decades prior telling a young Rinker how he was accomplishing something by simply not quitting. I found myself at times skimming through some of what Buck wrote about the history of the Trail and people who rode it, but felt it an excellent book that struck me as at least somewhat romantic and quixotic in the telling of a quest tale. Three pieces of writing from over the past few weeks struck me as really well done and smile-inducing, with one from the New York Times Magazine, one from a blog, and one a newspaper. The NYT Magazine feature was "The Amateur Cloud Society That (Sort Of) Rattled the Scientific Community" by Jon Mooallem and it was a very cool look at Gavin Pretor-Pinney, a Brit who started a Cloud Appreciation Society and spearheaded the successful effort to get a cloud formation official status recognition. Mooallem's writing feels to lean towards the lovely and almost mystical, with his great book Wild Ones (that I wrote about in 2013) an example, and this piece definitely fit the same bill with the conclusion just making the reader feel good. Another writer whose work can be particularly emotional and thought-provoking is Joe Posnanski and he recently did an awesome blog post that was then posted on the site of his employer, NBC Sports. "Hamilton" is about taking his 14-year-old daughter Elizabeth to see the Lin-Manuel Miranda play in New York and the post is really lovely, and then made all the more so by the story Posnanski tells in the postscript added on. The final piece to note here is the shortest with "How a firefighter’s dying wish helped start one of Miami’s best pie shops" by Carlos Frias for the Miami Herald and it's a great story of love, friendship, remembrance, and accomplishment. 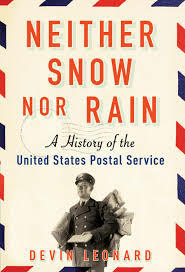 Neither Snow Nor Rain by Devin Leonard was a really interesting book with the subtitle A History of the United States Postal Service. In telling a compelling story about something I might not have expected to find as such, the book reminded me of the Beth Macy book Factory Man, which I wrote about in 2014, or to a lesser extent, the Tom Vanderbilt book Traffic, that I wrote about in 2008. Additionally, Leonard's work brought to mind the excellent Esquire article "Do We Really Want to Live Without the Post Office?" by Jesse Lichtenstein. I liked quite a bit how at both the beginning and end of Neither Snow Nor Rain, Leonard wrote about Evan Kalish, someone who visits Post Offices across the country and chronicles the travels on his blog, Going Postal. Kalish's story struck me as being very cool in having a combination of Americana and a case of some who found a thing they like and dove into it. In terms of the historical details from the book, Leonard wrote of how in 1737, Benjamin Franklin became Postmaster of Philadelphia and then Postmaster General of America on July 4, 1776. Postal history through the years then included the crusade against immorality by Postal Inspector Anthony Comstock, air mail, rural free delivery, and private delivery services, both hundreds of years ago and in then in the 1970s via FedEx, UPS, and DHL. Leonard wrote of how in 1947, the Post Office delivered 36 billion items, 114 billion in 1982, peaked at 213 billion in 2006 and was back down to 171 billion in 2010. This drop in volume and accompanying revenue combined with the how the Post Office must operate, with being legally required to provide universal service six days a week to every American home and business and have service costs determined by a Postal Regulatory Commission has led to the current fiscal problems suffered by the Post Office. Related to the Commission, Leonard as a Businessweek writer just did "Making No Cents" on how the cost of sending a first class letter was for some reason recently dropped two cents. All in all, an excellent book from Leonard and anyone remotely interested in the subject would likely enjoy it quite a bit. There was few different interesting stories from Bloomberg Businessweek lately, with two features and two short pieces to note here. The longer stories were "The Real Story of How Amazon Built the Echo" by Joshua Brustein and "Even the World's Top Life Coaches Need a Life Coach. Meet Martha Beck" by Taffy Brodesser-Akner. "If it makes you feel good, do more of it. And if it makes you feel horrible, maybe you should back off a little." "How did I come to believe this, and does it serve me to continue believing it?" Two smaller pieces that I found of note were "The Party’s Over in Alaska" by Jennifer Oldham on Governor Bill Walker reacting to the impact of low oil prices on the state's economy and from Devin Leonard, "Making No Cents," a story related to his book Neither Snow nor Rain: A History of the United States Postal Service. 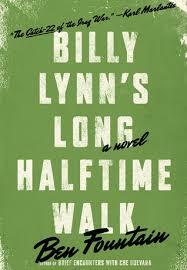 Billy Lynn's Long Halftime Walk by Ben Fountain was an entertaining novel about the surviving members of Bravo Squad, U.S. soldiers back home on a promotional tour of sorts after their actions during a firefight in Iraq. Set largely in Texas Stadium during a Thanksgiving Day Dallas Cowboys game, it's an interesting and contemplative book focused on 19-year-old Billy Lynn and the absurdity of he and his squad mates being feted as heroes prior to being shipped back to war. It's a fast read from Fountain and while I kept thinking it would culminate in something different, the book struck me as extremely heartfelt and seemed true to life, even as it told the story of a seemingly unreal life situation. I first heard of the novel in relation to it as the basis of a major motion picture coming out in November, with Steve Martin playing Cowboys owner Norm Oglesby, and am definitely interested in seeing the movie. Some amazing writing I've seen recently detailed people dealing with the effects of violence, with three of the pieces around guns and one an incomprehensible act on a toddler. For The New York Times Magazine, C.J. Chivers wrote "A Lone Bullet’s Long Toll" on Dustin (Doc) Kirby, a former Navy corpsman who was hit with a sniper bullet ten years ago in Iraq and Pamela Colloff for Texas Monthly provided "The Reckoning" on Claire Wilson, a victim of the University of Texas Tower shooting in 1966. The feature from Colloff was amazing and brought to mind her 2006 oral history of the shooting, "96 Minutes," also for Texas Monthly. Two pieces done for GQ were also by great writers, with "Should We Get Used to Mass Shootings?" by Michael Paterniti and "A Positive Life: How a Son Survived Being Injected with HIV by His Father" by Justin Heckert. The Heckert story particularly stuck with me in being just bananas in it's subject, and also really well written. Two amazing recent sports stories both dealt with subjects that have gone through profound (and at least in part self-caused) difficulties, with one piece done for ESPN and the other the Fox Sports website. "The Secret History of Tiger Woods" was an amazing 12,000 word feature by Wright Thompson and though it didn't generate as much immediate interest as the story on Woods, "The Rise and Fall of Rafael Palmeiro" by Flinder Boyd was excellent, and Boyd seemingly doesn't getting the attention deserved for what a good writer he is. The Road to Little Dribbling by Bill Bryson was an entertaining book about traveling throughout his adopted Britain, twenty years after doing so for his book Notes from a Small Island. Bryson is a guy who has written incredibly widely, with my tremendously enjoying his books One Summer: America, 1927 (which I wrote about two years ago), In a Sunburned Country about traveling in Australia, A Walk in the Woods on hiking the Appalachian Trail, and The Life and Times of the Thunderbolt Kid about himself growing up. I probably didn't love The Road to Little Dribbling as much as much as I did Bryson's books on Australia and the Appalachian Trail, but found it to be an enjoyable and funny read that further detail can be found on in a New York Times book review. 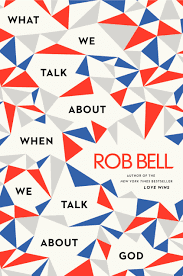 What We Talk About When We Talk About God by Rob Bell is a book I was interested to read after I thought excellent Bell's book Love Wins, which I wrote about in 2011. While I found this more recent work to be a bit of a slog to read at times, it did have a few things I thought of particular note. The big idea I took from it was Bell writing on just how mysterious and complex the universe is and how to say that God is simply impossible ignores that mystery and complexity, we simply don't know. Related to this, Bell writes that when we talk about God, we're using words, phrases, and forms to describe something beyond words, phrases and forms. It's like trying to use one construct to describe something that's from a completely different construct. I was also struck by how Bell in the body of the book as well as appendix mentioned several people whose work I appreciate, including lawyer and activist Bryan Stevenson and writers Haruki Murakami, Yann Martel, Christopher McDougall, and Bill Bryson. The last thing to mention in this post is a story I read recently that deals with the same topic of God, faith and the church. Written for GQ Magazine, "What Would Cool Jesus Do?" was an entertaining and kind of touching story by Taffy Brodesser-Anker about mega-church Hillsong NYC. In the category of sports writing were "The Education of Alex Rodriguez" by J.R. Moehringer for ESPN The Magazine and "Officer back on the streets, with a story to tell" by Gregg Doyel for the Indianapolis Star. My favorite business piece of the year was "Inside Amazon: Wrestling Big Ideas in a Bruising Workplace" by Jodi Kantor and David Streitfeld for the New York Times. Two short pieces that struck me as really profound were "An Extra Angel on Top of the Tree" by Jessica Strawser for the New York Times and "Thomas Gray lived six days, but his life has lasting impact" by Michael Vitez for the Philadelphia Inquirer. Also, three additional pieces I linked to in the past year that stood out were all about writers and events in their lives, with "The Friend" by Matthew Teague for Esquire and "The Accident" by Michael Paterniti for GQ both first-person accounts and "Why the Best War Reporter in a Generation Had to Suddenly Stop" done on C.J. Chivers by Mark Warren for Esquire. There's of course other great stories from last year, I'm sure including ones I've read and neglected to mention here,so a link to note is The Sunday Long Read Best of 2015 list. Sports writers Don Van Natta Jr. and Jacob Feldman send out a compilation of their favorite weekly stories and for anyone interested in great feature writing, it's a fantastic resource to subscribe to. 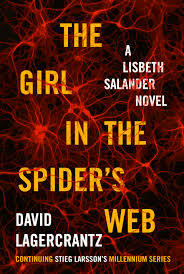 The Girl in the Spider's Web by David Lagercrantz was an excellent work of fiction as the fourth book in the Millennium Series started by Stieg Larsson with his books The Girl with the Dragon Tattoo, The Girl Who Played with Fire, and The Girl Who Kicked the Hornet's Nest. Larsson died in 2004 and his family commissioned Lagercrantz to write another novel on the characters of Mikael Blomkvist and particularly Lisbeth Salander, with very enjoyable results. Gilbert writes that someone should be creative simply because they enjoy being creative. It's not about toiling away in pursuit of a goal, but rather the making of things because they’re fun to make. If they're not fun, then why make them? Additionally she covers how creativity and a creative life isn't necessarily about writing or producing art and Gilbert tells the story of her friend who started figure skating again in her 40's. She skated in the mornings prior to her day and wasn’t winning medals, but did so because she loved to skate. In writing about her figure skating friend, Gilbert notes that she didn't quit her job to pursue skating, bur rather maintained her responsibilities in life, and skated as a vocation. Also, Gilbert covers how her father would hold down a normal job and then outside of work pursue whatever was interesting to him, with one example beekeeping. The idea covered in the book is that people have responsibilities and once those are met, there's usually still going to be time that can be made available for creative side endeavors that are fun. In fact, Gilbert also writes of how creativity generally shouldn’t be expected to pay the bills as it’s not a fair burden to put on those pursuits. Another concept that Gilbert writes about is that creative pursuit doesn't have to be about pursuing a passion. If someone is passionate about a particular thing and pursues it in a healthy way (again, with also meeting the responsibilities of life) that’s great, but it's also great to simply pursue things of interest. Through seeing what's of interest, then learning about and working on that thing, a lot of cool learning and work can develop. Maybe it'll become a passion, but maybe remain an interest until that interest replaced by something new that strikes the fancy, and that's totally fine. Gilbert also covers about when working on something, the result isn’t always going to be great. I found particularly cool her writing about creativity and particularly creative genius not as character traits, but as things, which sometimes you've got and sometimes you don't, no big deal. With this the case, people should be willing to just do and produce stuff and not get too hung up on how great a particular output is. The important thing for someone who enjoys to create is that they just create. Sometimes the work great, but if not, you finish it and then move on to the next thing. Gilbert makes the case that perfection can be the enemy of good and that heck, if there has to be a choice made between them, done is better than good. Related to this, Someone shouldn’t dwell on their failures or successes, but simply create and move on as motion always beats inertia. Additionally noted in the book is that creativity as a pursuit isn't essential, it’s not medicine or subsistence farming, its fun and people being creative shouldn't take it too seriously. This is especially the case if someone worried about what others might say of their creative work. Gilbert writes that people really aren't paying that much attention so those who want to be creative should relax, find things of interest, learn about and pursue them, make stuff and put it out there for others. Whether others are long captivated by work isn't as important as the person doing the work enjoying the creation of it, and believing that what they do has value. Covered in the book is the importance of someone having a sense of entitlement that they're allowed to be there, and perhaps this sense of entitlement is delusional, but Gilbert writes of how if you're going to live your life based on a delusion, as many of us do, choose a delusion that's helpful to you. On this topic of people and their reaction to work created by others, Gilbert notes how when something created, people are free to do with it what they may, including completely misunderstand it. The artist free to create what they want, and receiver of the art free to consume it as they want. The last thing to note about Big Magic is that toward the end of the book, Gilbert writes about her first published story, "Pilgrims" from 1993. She wrote the auto-biographical piece and Esquire bought the finished story, but then needed to cut pages from the magazine and gave her a choice to either cut 30% or hope it would run later. She choose to cut and Gilbert wrote of actually finding value in the process of cutting the story and how the shorter version neither better not worse than what she started with, just different. That story getting published in Esquire, and it may never have if she hadn't been willing to cut it for that particular issue, wound up getting her an agent and on her way to success in writing. All from viewing the story not as a sacred thing that couldn’t be revised, but rather something she enjoyed writing, put out there and then moved on from. 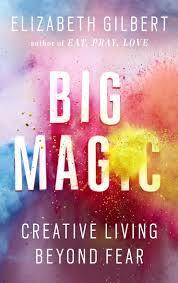 Big Magic was a really enjoyable read for me and one of the things I found I kept thinking throughout was that Gilbert's advice on creativity reminded me of writing on life produced by the late public policy expert John Gardner. With this the case, it was fascinating to me to see that when I wrote in 2013 about Gilbert’s book The Signature of All Things, I referenced part of that novel reminding me of writing from Gardner.